Studio Visit: T Project — Portland Supply Co.
Teri Gelber had us over to her home for tea and to talk T Project. We were pleasantly surprised when Teri started preparing an amazing spread of tea accoutrements she picked up. Her food and art background guides her approach to tea -- It’s about the sourcing of the ingredients, the layering of flavors, the colors, textures and presentation. Creating delicious organic blends that retain the integrity of the tea leaf itself is her aim. It's about the process as well as the nature of what tea is and how it's embraced culturally, both here and afar. The company was named after her son and main inspiration -- Theo. Finally, after almost 2 years of researching and perfecting her blends, she has launched a luxe line of teas that taste as good as all of the thought and work that went into them. Each tea is named from another one of Teri’s passions: music. Songs from her childhood inspire the mood of the tea, such as her Chinese oolong "Shine On Brightly" named for a Procol Harum tune from the sixties. Teri is also doing some amazing collaborations with other Portland makers. Currently, she sells ceramic tea cups that local potter Meadow Anderson collaborated on. 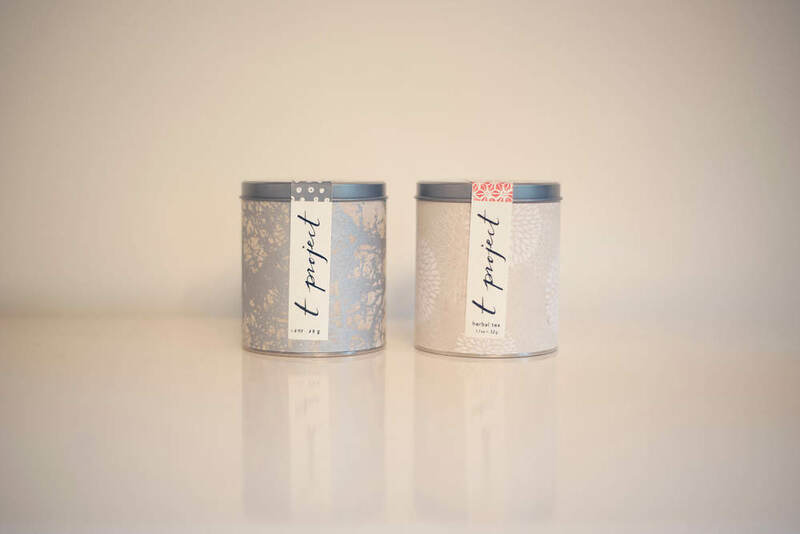 And her soon to be released spring/summer blend features a label by Portland artist Anya Spielman, produced in a limited edition of 200 canisters. T Project challenges Portlanders to slow down and enjoy one cup of tea at time. In Portland, T Project is sold at www.tprojectshop.com as well as Alder & Co., Little T’s in Union Way, Pasta Works, City Market and the soon to open Moreland Farmers Pantry in Sellwood. She makes custom blends for Gruner, Boke Bowl, Bakeshop and Din Din. T Project will also throw a delicious custom tea party in the comfort of your own home! When I got pregnant 8 1/2 years ago we were trying to agree on a neighborhood in LA to raise our soon-to-arrive child. I loved the beach areas and canyons where I grew up but my husband craved walkable urban city life and so through that disagreement it became clear we were ready for a big change. Portland seemed like the perfect place to raise our baby: more sustainable, simpler and a bit easier to navigate with a kid. Also, Morgan Brownlow was cooking delicious rustic food at Clark Lewis back then and between the farmers markets and Pastaworks, I knew we would be taken care of culinarily speaking. When we got here, I kept wondering why people were holding doors for me, helping me, and being so friendly and then I realized that it’s the way things are done here. Now that is something all of our children can learn from. People continue to be kind and the food scene is evolving and changing and feels vibrant. Why leave? Except for some sun every now and then! 2. What are your favorite things happening in Portland? In other cities, you have to plan everything out, but in Portland, there’s still a sense of spontaneity, which is totally my style. I love being able to go see a concert on a whim and actually get a ticket or dash over to PSU or PICA for a great art/design lecture, or run to Powells to hear an author speak or dash out to meet a friend in need. If you pay attention, there’s a lot to do here. I really am amazed by the self-starting culture here, watching small brands grow and become national. From food to design, people help each other out and want the best for each other. We know how challenging it can be working in a small city with not a lot of capital to get started and so there is a true sense of empathy and support. Other cities are deadly competitive. I’ve always been a huge tea drinker, one of those people with the tea cabinet that spills out when you open the door. I was a food writer, worked in great restaurants, produced radio, worked in film, had a ceramic studio, taught cooking and traveled. T Project was the path to bring all of these passions and flavors together into something I truly believed in and cared about - I’ve always been a health nut and I think tea is a great start to a healthier existence. I also wanted my son to see me work hard and watch something grow that we could be proud of. His name is Theo and I’m Teri, so there you have it: T Project. Oh there are so many obstacles that those small business books don’t warn you about. For me, it’s the emotional ups and downs and my own time management. One day I feel like there is so much possibility and people will buy my products and the next day I’m wondering if I exist out there. Learning to use my time effectively is an on going battle for sure. Sounds corny, but I see it all as a spiritual practice, believe it or not! Stay in the present, make the most of the moment. I’ve have a had a crush on Yohji Yamamoto and Dries Van Noten most of my adult life. I love the strange fine line between elegance, comfort, textile integrity and a feeling of the hand. Very different designers, but they cover the bases to me. I love to check out what Karen Walker and Sophie d’Hoore are up to in fashion. Frida Kahlo, the village ladies from the mountains of Sapa in Vietnam, and, my dear friend & designer, Lorraine Wild in LA. In Architecture, Adolf Loos speaks the loudest to me. And I can’t leave out the Italians: Paola Navone & Gio Ponti rock. The trees are fantastic. The number of them, the gigantic-ness of them, the breadth of varieties. Though I deeply missed my succulent-filled childhood landscape, the trees here became my new best friends. I volunteered at Cistus Nursery out on Sauvie Island when I first moved so that I could still indulge in those familiar Mediterranean species a bit more. And of course: The people. You can be who you want to be here, there aren’t so many rules, and to me, that makes for a more interesting city. I love the bridges. I love the size of the city. I love the bicycle respect. I love that we can go skiiing today and to the beach tomorrow. I love the farmers who grow our food and the chefs that cook it. I love all the small business people doing their best. I love the way we can connect to each other so easily. I love the spontaneity I can have in my day to day life. That’s tricky, I love all the areas for different reasons, but I’m going to go with Northeast - It’s got a good mix of all types - moms, hipsters, earthy folks, working people, rich, poor, black, white --you get it all over here. It feels urban in terms of being able to zip over to Alberta on bikes or walk up to a bakery or bar. And if I want to dress up, people are into that but If I’m in my yoga clothes all day, that’s flies as well. Privacy and the ability to express myself in any way I choose there. I am super social but have always craved a lot of alone time to think and ponder and create. I love that I can lock the door knowing it will be the way I left it when I come back; it’s all mine! My studio is in a basement in an old building in the Pearl. I love the mix of total sanctuary in an urban setting -so I can dash out for a bit of sun and a city walk when I start to feel too alone. I got surrounded by a pack of wild dogs in a small Mexican village.